The 2018 Portsmouth Homecoming is just a week away! Cape Lookout National Seashore and the Friends of Portsmouth Island would like to invite the public to the Portsmouth Homecoming on Saturday, April 21, 2018, in historic Portsmouth Village. The Styron-Bragg house, the Wallace-Grace House, and the Jesse Babb House are among the several houses that will be open for this one day. The theme for this year's Portsmouth Homecoming is "A Step Back in Time." Events for the day include a special descendant area for family displays and gatherings – bring your scrapbooks and photos! Meet the descendants of Portsmouth Island and hear their stories. The post office will be open for a one-day stamp cancellation, and hymn singing will once again be held in the church. After the Homecoming program under the tent, all will gather for dinner on the grounds – the best potluck you’ve ever seen! Ice, paper products, and tea will be provided. Please bring food or dish to share and any beverage you wish. Be sure to label your food containers and coolers. Carts will be available at the dock to load your coolers, chairs, etc. to be taken to the food area so you won’t have to carry them. We want this to be a day where you will have time to visit, explore the houses in the village, and have a great meal. Boats returning to Ocracoke will run as long as needed to get everyone off Portsmouth. Jim White, Friends of Portsmouth Island board member, descendant, and Portsmouth historian, will emcee the program under the tent. The first 500 people who arrive that day will receive the coveted commemorative Homecoming pin for 2018. Reservations for the passenger ferry from Ocracoke to Portsmouth should be made with Rudy Austin (252-928-4361). The cost is $20 per person, round trip. Ferry reservations are required. 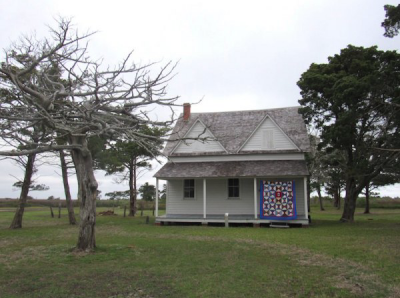 If you are on the island Friday night before Homecoming, be sure to come by the Ocracoke Preservation Society Museum from 5-7 pm. OPS will be hosting a book signing and reception for Ray McAllister, who is the Friends of Portsmouth Island's newsletter editor. Ray has combined and published two of Ellen Marie Fulcher Cloud’s books into one with two new pieces written by Ellen, more pages, and photographs. The book is titled “Ocracoke Lighthouse and the Old Salts,” and the price for this new hardcover book is $21.95. Come out and meet Ray on Friday night! Ellen passed away in December 2016, but her daughters Simona and Deidra will be there to greet you. Not sure what Homecoming is all about? Read the Current's story from 2016 here.